Hundreds of commuters and shoppers in Brighton town centre were offered the ancient custom of “ashing” and the opportunity to respond to prayer requests when the Right Revd Dr Martin Warner, Bishop of Chichester and a Bishop of the Society took to the streets of Brighton with colleagues on Ash Wednesday, the start of Lent. Bishop Martin said: “The day is about prayer. It is about anything that seriously matters to people in their lives. We all have hurts that need to be healed. 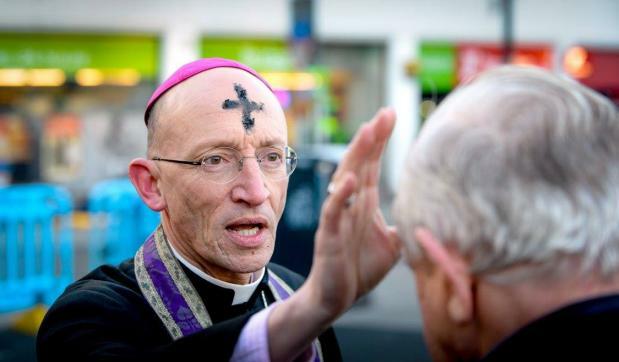 Bishop Martin also visited Chichester City Centre at the Market Cross at lunchtime and also celebrated an Ash Wednesday service in Chichester Cathedral in the evening. More photos of Bishop Martin in Brighton can be viewed here. Other bishops and clergy of The Society similarly took to the streets up and down the country including places like Oxford, Liverpool, London and even at Heathrow Airport. 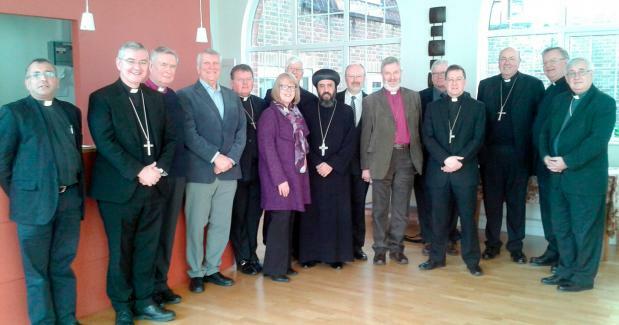 At the beginning of February the Right Revd Norman Banks, the Bishop of Richborough and a Bishop of the Society, attended a meeting of 14 Bishops from Catholic, Anglican, Lutheran and Coptin Orthodox churches, from different parts of England at the Focolare Centre for Unity at Welwyn Garden City, Hertfordshire. The ecumenical gathering also included the General Secretary of Churches Together in England, the Revd David Cornick, himself a United Reform minister. The keynote address given by the Revd Dr Calan Slipper, was entitled Chiara Lubich and Receptive Ecumenism, how spirituality facilitates Christian unity. attended a meeting of 14 Bishops from Catholic, Anglican, Lutheran and Coptin Orthodox churches, from different parts of England at the Focolare Centre for Unity at Welwyn Garden City, Hertfordshire. The ecumenical gathering also included the General Secretary of Churches Together in England, the Revd. David Cornick, himself a United Reform minister. The keynote address given by the Revd. Dr Calan Slipper, was entitled Chiara Lubich and Receptive Ecumenism, how spirituality facilitaties Christian unity. The Council of Bishops of The Society held its first residential meeting of the year on 10 and 11 February 2015. After reviewing recent developments, we discussed a number of initiatives. Among these were more structured ways of publicizing vacancies and also of drawing to each other’s attention both vacancies and priests who are looking to move. We also hope to use modern mapping and database technology to help us to take a strategic overview of our parishes and priests. The elections to the General Synod later this year will be an important opportunity to demonstrate the commitment of bishops, clergy and laypeople of The Society to responding to the invitation to flourish within the life and structures of the Church of England. We hope to arrange a series of residential meetings in 2016 to enable all our clergy to take counsel with their bishops on a diocesan or regional basis, as appropriate. We also reflected on the recent consecrations in York. The presence of Bishops of The Society at the Bishop of Stockport’s consecration gave expression to our commitment to the five Guiding Principles which form part of the House of Bishops’ Declaration. The Bishops were there to honour the arrangements that provide for the flourishing of all in the Church of England, not least those who are committed to our care – even though they could not assent to the ordination by sharing in the laying on of hands. A selection of photographs of the day kindly taken on behalf of The Society by Graham Howard, a support of The Society. Forward in Faith expresses its gratitude to the Archbishop of York for making arrangements for the Bishop of Burnley’s ordination which gave full expression to the Guiding Principles enshrined in the House of Bishops’ Declaration. Read more. 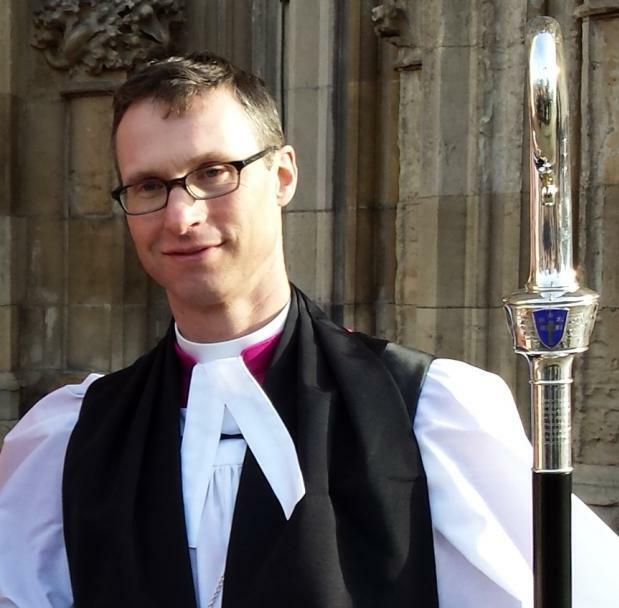 "The Church has stated afresh its commitment to enabling all traditions to flourish within its life and structures, and I hope that my appointment is seen as evidence of that pledge." Read more. The appointment of a traditionalist bishop had been "essential" for Anglo-Catholics, [Bishop Philip] said: "The thing that traditionalists need . . . is a line of bishops to whom they have access, and this is a very beautiful covenant that the Archbishops have made with the Church, that wing of the Church, to show that those promises will be honoured." Read more. "My consecration sets another precedent, which is to make it possible that those who cannot accept this development [of the consecration of women as bishops] in the Church's life to remain as loyal Anglicans." Read more. for the office and work of a bishop in your Church.